The only place they touch the spindle is right around the base, so it’s no wonder they clamp poorly and release grudgingly. I tried several others with the same result. I did the small collets, the ones I’m most likely to need, and left the big ones for another rainy day. They don’t have much clamping range and seem good only for exact-inch-size rods. I should lay in a stock of ER16 and maybe ER32 collets for small stuff. This entry was posted on 2019-01-16, 07:54 and is filed under Machine Shop, Oddities. You can follow any responses to this entry through RSS 2.0. You can leave a response, or trackback from your own site. Your data points may be skewed because collets are slit. 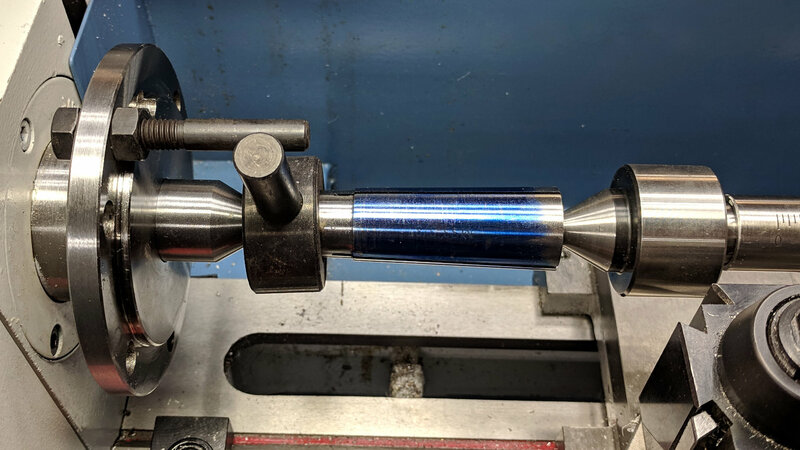 Blueing should be done with a pin of nominal diameter in the collet bore, otherwise the front side can simply compress more than back and seemingly not register with the spindle. On the other hand, I almost never clamp nominal diameter stock – it’s usually a hair smaller no matter what it is – in which case it makes sense to thin the back side a bit. Did you leave the file marks or did you polish the surface? I can’t tell if what looks like a texture is from the bluing or the underlying material. So I tried out the 1/2 inch collet. It has a 0.487 relaxed opening and contacts the spindle at the narrow end of the taper, pretty much like the un-filed version in the post. Ramming a 0.500 inch ground steel bar into it (about 3/4 inch is all it will accept) moves the contact patch to the big end of the taper (at the right end of the spindle), but I must clamp the base of the collet in the bench vise and pull with all my strength to get the bar out again. I don’t know how I’d get enough of a grip to extract a small cylindrical part, unless it had an internal screw thread or a transverse hole. A 0.490 inch bar fits snugly in the collet and can be separated by hand, but doesn’t move the contact patch far from the base. I was unwilling to tighten the drawbar, because I didn’t want to hammer the bearings again. So I think the (unmodified) collet would work for any rod between 0.492 and 0.496 inch, which isn’t much of a range: call it 0.1 mm. Those look like watchmaker collets: precise and delicate! Precise yes, delicate, so-so. With 20mm capacity and 120mm overall length, they are much bigger then what would be considered “watchmaker” size.